Prof. Emeritus Tan Sri Dato’ Dzulkifli Abdul Razak, the Rector of the International Islamic University Malaysia (IIUM) received mock cheque from two corporate organizations for the financial assistance program for IIUM underprivileged students. 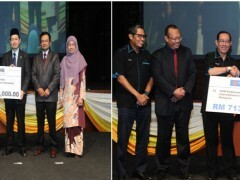 The mock cheque were presented in conjunction with Al Liqa Al Jamaie at the IIUM Cultural Centre, Gombak Campus. The two corporate organizations, Bank Pembangunan Malaysia Berhad (BPMB) and Bank Rakyat, Contributed RM1,000,000. and RM713,038 respectively for the financial assistance program initiated by the IIUM Endowment Fund (IEF) for the IIUM needy ( underprivileged ) students. The corporate zakat contribution from BPMB, presented by Ustaz Mohamad Salihin Bin Deris, the Head Group Shariah will benefit 241 deserving IIUM students for their tuition fees and monthly stipend. Meanwhile, the Corporate Zakat from Bank Rakyat, presented by Ustaz Mohd Zamerey Abd Razak, the Vice President, Compliance Shariah will benefit 10 local students and 5 international students from Cambodia under the Ummatic Scholarship program. IEF, a division of the University, is responsible to solicit (seek ) fund for the IIUM underprivileged students' financial assistance programs; ranging from one-off financial assistance to full board scholarship program, which include contributions from organizations as well as individuals. In 2018, IEF had successfully collected RM15 million and Rm12 million was used to assist nearly 3000 students.